This post is from our new site, Mobile Sports Report. In a huge decision that will no doubt increase the worldwide audience for the most-viewed live event, NBC will stream the Super Bowl online along with broadcasts of the network’s Wild Card playoff games and the NFL Pro Bowl, according to an Associated Press report. Users of Verizon Wireless’s NFL Mobile app will also have access to the games, along with additional camera views and in-game replays. Forget college games — there’s no doubt that even with its already huge TV audience, the Super Bowl would likely become the most-viewed online sports event ever, even if it’s just on a laptop or phone in the bathroom of the house hosting the Super Bowl party. Though we haven’t yet been able to find any press releases from all the participating companies we are also betting that Verizon will use the Super Bowl access in a massive way to promote its NFL Mobile app, which it has been offering free of charge to new high-end cellphone customers. NFL Mobile users currently can watch NBC’s Sunday night games live, along with Thursday night NFL Network broadcasts and ESPN’s Monday Night Football games. View the rest of the post at Mobile Sports Report. NFL Live on Verizon Phones: How Much Data do You Need? If you want to watch the NFL live on your Verizon phone, how much data will you need? Unfortunately when you ask Verizon you can get different answers to the same question. Read our post over at Mobile Sports Report to get the scoop. Editor’s note: This is the first in a new series of company profiles about service providers, application developers and equipment manufacturers in the 4G video marketplace. Today’s profile is of Ortiva Wireless, which makes networking gear designed to give service providers better control over video content for wireless networks. If there is a gold mine in the forthcoming future of 4G wireless networks, it will probably revolve around video. There’s not a single ad or commercial for any new smartphone or tablet that doesn’t include some kind of promotion showing how good the device is at giving you video on the go. And it makes sense, since everybody loves video. Who doesn’t want to watch as much video as possible, wherever they go? Of course, anyone familiar with the opex side of the house knows that for many service providers the lure of profits via video may contain some fool’s good. That is, something that looks good but isn’t so valuable — in this case simply because of the high costs and extensive operational management involved with bringing time-sensitive, high-bandwidth streams to a small device that may be always on the move. With 4G networks in their infancy that means there is still plenty of room in this mine-full of golden metaphors for pick-and-shovel purveyors, those who would provide the tools to help service providers dig out the value that video presents. That’s the basic business model for a startup called Ortiva Wireless, whose Internet video optimization gateway (or iVOG for short) is designed to let operators improve their customers’ wireless video experience, while reducing costs and management problems for the service provider. 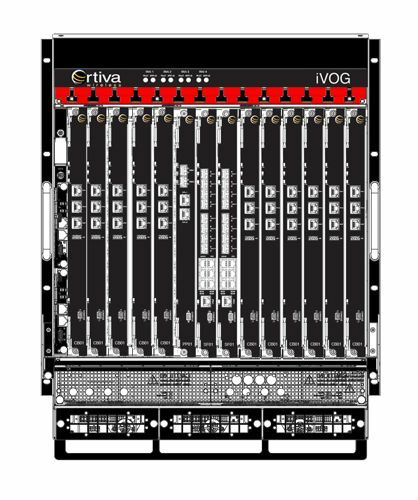 The Ortiva Wireless iVOG chassis. Credit: Ortiva Wireless. You are currently browsing the archives for the Internet Video category.